On a beautiful late spring afternoon, this past year, a young woman received some devastating news. She had just gotten back her IBCLC test result. It was not what she had hoped for. In fact, it was not even close to her expectations despite her past experience and educational background. Unfortunately, this hypothetical situation occurs all the time. Someone thought they were going to breeze through the examination, told all their friends, made plans for their future, and then got an embarrassing reality check from the IBCLC test. The International Board Certified Lactation Consultant (IBCLC) Examination is quite simply an objective assessment of a test taker's requisite foundation of knowledge and skills. IBCLC test scores are used by the International Board of Lactation Consultant Examiners (IBLCE) as a uniform standard of qualification. While it may not be fair, all of a person's plans for the future may be dependent upon needing a certain IBCLC test score. That is the whole purpose of our IBCLC Exam Secrets study guide: to give test takers the keys to understand how to succeed on the IBCLC test. If you'd like to get the IBCLC test score you deserve, to quit worrying about whether your IBCLC test score is good enough, and to beat the test taking game so you can become a International Board Certified Lactation Consultant (IBCLC), then this might be the most important message you read this year. Our comprehensive study guide for the IBCLC certification exam is written by our exam experts, who painstakingly researched the topics and concepts that you need to know to do your best on the IBCLC test. 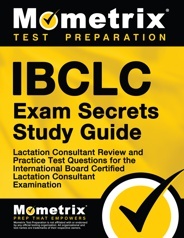 Our original research into the International Board Certified Lactation Consultant (IBCLC) Examination, offered by the International Board of Lactation Consultant Examiners (IBLCE), reveals specific content areas and skills that are critical for you to know on the IBCLC test. We've taken that information and developed a study guide that is guaranteed to help you be successful on the IBCLC test. Our company's name is Mometrix Test Preparation, and we have a team of standardized test researchers who have worked on developing our study guide for the IBCLC test. The standards for who gets to work on the team are very strict. We demand the best for our customers, and only those who met our exacting standards made the cut. The dedicated research staff have years of combined experience in mastering the content and skills necessary to succeed on the toughest exams. Some academic studies have revealed that test takers do not really benefit from the traditional test preparation process. But we knew there had to be a solution. If test takers were not doing well on the IBCLC test despite high intelligence, there had to be a set of secret keys to the test that would open the door of success for these test takers. We created the product in part because we were frustrated by the options available to test takers who really wanted to do well on the IBCLC test. A common approach is to TEACH the material, instead of TEACHING THE TEST. That's not necessarily good enough for the IBCLC test. You have to know how to apply the knowledge. Most test takers already have a general knowledge of the material that will be covered on the exam. One reason some test takers do well on the day of the test is that they have made the critical connection between the material they learned and how to use the material to succeed on the IBCLC test. Details the EXACT STUDY PLAN for the IBCLC test that we believe gives the most results in the least time. No matter if you're studying for a week or a month, you won't waste the precious study time you have on useless activities. Before we go any further, let us clarify what IBCLC Exam Secrets is not. It is not a stale rehash of all of the things you have already learned in the past. IBCLC Exam Secrets is our exclusive collection of the tips and the information that we have specially selected to give you the best results on the IBCLC test for the least time spent studying. It's written in everyday language and is easy to use. We cover the essential skills necessary to do well on the IBCLC test, plus comprehensive reviews covering all the essential test areas individually. I purchased the Secrets file, and I just wanted to let you know that I got a 99% on my test. I just want to thank you again, and hope you have continued success in your ventures. Sincerely, P. L.
I used the Secrets study guide for five days. The study guide made the test so easy to understand. Like you said this program is worth 100's of dollars. To me 1,000's!! THANKS, C. G.
I just had to thank you guys for the test prep! I bought the guide as a last minute prep, I mean maybe 5 hours before the test. Like I said, I had ZERO preparation! I was nervous about the test let alone receiving the score I needed. I read the guide through only once before test time and needless to say, the only way I passed was thanks to your refresher!! B. Just dropping you a note to let you know that I am completely satisfied with the product. I had already taken the test once and landed in the 75 percentile of those taking it with me. I took the test a second time and used some of your tips and raised my score to the 97 percentile. Thanks for my much improved score. D. W.
I heard about your website from a friend. I am enrolled in a review course, and in hindsight, I wish I wouldn't have taken my review course and instead spent a fraction of the money on your program. Thank you! Z. L.
One: The guide must be written by writers who have painstakingly researched the topics and concepts needed to succeed on the IBCLC test. The blind cannot hope to lead the blind. IBCLC Practice Test Questions: Think you're ready for the IBCLC test? Test yourself using our practice test questions. Find out if you're prepared or if you need to head back to the study guide for another review. Use our practice test questions to make sure that you're not caught off guard on the day of the test! Our IBCLC practice test questions give you the opportunity to test your knowledge on a set of questions. You can know everything that is going to be covered on the test and it will not do you any good on the day of the test if you have not had a chance to practice. Repetition is the key to success and using the practice test questions allows you to reinforce the strengths you already have, while improving the weaknesses that you need to overcome. Detailed answer explanations are included for the questions. It may sound obvious, but you have to know which questions you missed (and more importantly why you missed the question) to be able to avoid making the same mistakes again when you take the real test. That's why the practice test questions we include for the IBCLC test include answer keys with detailed answer explanations to each question. The in-depth answer explanations will allow you to better understand the questions that were difficult for you or that you needed more help to understand. Study Skills teaches you everything you need to know about studying, so that you can maximize the effectiveness of the time you spend in preparation; the techniques provided are guaranteed to get you the results you deserve on the day of the test. Study Skills is the most in-depth, comprehensive study manual available and is completely free with the purchase of IBCLC Exam Secrets. Organizations and Sites: As you prepare for the IBCLC test, you'll likely be doing a lot of information gathering on the Internet. We make that process easier for you by providing you with a condense, easy to use list of the top organizations and websites that will make your preparation time much more productive and effective. Buyer's Guide for Breast Pumps: Many women will want to pump in addition to breastfeeding so that they can leave the child for longer than the period between feedings. Our buyer's guide will help you make solid recommendations. How to Store and Use Human Breastmilk: Once a patient has pumped, they have to be sure to store breastmilk properly and abide by "expiration dates" based on the method of storage. Our guide gives you the complete details so you can be sure your patients store breastmilk properly. How to Deal With Infant Crying: One of the main concerns of your patients may be that their infant cries a lot, which prevents them from breastfeeding properly. Use these exclusive tips to help teach new mothers how to calm their babies and get them sleep through the night sooner. How to Know If Your Patients are Experiencing the Baby Blues: Some sadness is normal for your patients after birth, but prolonged hopelessness can be harmful to a mother's psychological health and a developmental stress for the baby. We show you how to know the difference and when to recommend professional intervention for a patient. We insist that you order IBCLC Exam Secrets entirely at our risk. That's why when you order from this site it comes with a Risk-Free, 1-year 100% Money-Back Guarantee. There's absolutely NO RISK on your part. Why are we going to such great lengths? So go ahead and order your copy of IBCLC Exam Secrets today. Take the time to read it, use it, and profit from it. If you use any one of our secrets, and somehow fail to recoup your small investment in the form of the test result you want, send us an email at support@mometrix.com to arrange a 100% refund of the product price. IBCLC Exam Secrets can be ordered directly from this site. A printed copy will typically ship within one business day from our shipping facility. Or, if you prefer, you can order the study guide as an instantly downloadable ebook. It doesn't require any special software. If you can read this web page, you have all you need to start using and applying IBCLC Exam Secrets in just five minutes. You don't have to wait for anything to come in the mail. Download IBCLC Exam Secrets immediately! It's easy to order your copy of IBCLC Exam Secrets. The entire comprehensive package retails for $72.99, but is available to you today at the incredibly low price of $39.99. Just click one of the links below. If you would like to order through the mail, click here to order IBCLC Exam Secrets study guide by check or money order.